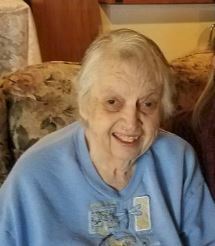 Vida Mae North- 89- Passed away Sunday morning, November 25, 2018, peacefully in her sleep at Asbury Park in Newton, KS. Vida was born December 3, 1928 in Southern Colorado to Elmer and Vivian Mae (Mathews) Burnette. Vida graduated high school and earned her teaching certificate. She married Jessie Raymond Carpenter December 4, 1949 and then focused her energy and love on their home and raising their four children – David Carpenter of Virginia, Gary Carpenter of Kansas, Donna Cruz of Kansas and Lena Baugh of Kansas. Vida was a grandmother of 18, great grandmother of 16 and great great grandmother of 3. In the mid 70’s Vida returned to college and earned her Associate of Arts Degree. Vida then married Earn North – they were happily married until he passed in the early 80’s. Vida loved sewing, quilting, crocheting. She was always working to make something beautiful to give to someone, often times Christmas and Birthday gifts to the children & grand children were home-made clothes or decorations she made! Vida is remembered by her children as a woman who was strong and independent. She was extremely intelligent, mechanically inclined and lived through some very rough and sorrowful times in our country yet she remained kind and carrying. Although our family is sad for Vida’s passing we come together in comfort knowing that she had accepted Christ as her Savior and Grandma is at peace in her heart, spirit, mind and body.